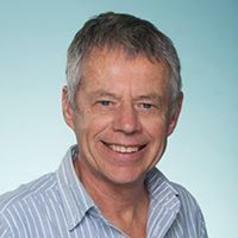 Mick Roberts is Professor in Mathematical Biology at Massey University, Auckland, New Zealand. His research interest is to understand the epidemiology of infectious diseases and optimise strategies for their control, using modern methods of mathematical analysis and developing new methods as necessary. He was previously a scientist at the Wallaceville Animal Research Centre near Wellington, where he was the leader of programmes in modelling infectious diseases and parasitology. He has held visiting fellowships at Oxford, Cambridge and Utrecht Universities. Professor Roberts was elected a Fellow of the Institute of Mathematics and its Application (FIMA) in 1992, and a Fellow of the Royal Society of New Zealand (FRSNZ) in 2008. He received the New Zealand Mathematical Society Research Award in 2006. He is the author of over 120 peer-reviewed publications, including more than 90 journal articles.